MYSTIFYING AUMDimension: 4 x 4 Inches Approx. Also Available Size: 9 x 9 I.. This EXCLUSIVE AUM is made of single piece of marble and adorned with beautiful world famous floral pattern in auspicious colours- Red, Green & Golden, signifying strength, growth and prosperity. Lends exquisite touch to one’s devotional feelings. As per Indian scriptures ‘Aum’ is a combination of Lord Brahma, Lord Vishnu and Lord Shiva. In the Vaastu shastra, it is believed that ‘Aum’ counters negative energy and protects the house/premises form Vaastu-dosh (architectural faults) and bring happiness, peace, prosperity, wealth, auspiciousness, progress, name and fame. In the field of Geomancy “Swastik’’ and “Aum”are considered as prominent emitter of positive energy. Bovis a scientist, recognized the effect of subtle energies and started measuring them in units. These energies can be measured on a Bovis scale with a pendulum, with a Lecher Antenna or electromagnetic energy meters. Scientific experiments have shown that ‘OM’ has possibly the highest energy level of one million Bovis. OM (AUM) has a paramount importance in Hinduism. Most vedic prayers start with AUM. "OM" is the reflection of the absolute reality, it is said to be "Adi Anadi", without beginning or the end and embracing all that exists. The mantra "OM" is the name of God, the vibration of the Supreme. When taken letter by letter, A-U-M represents the divine energy (Shakti) united in its three elementary aspects: Bhrahma Shakti (creation), Vishnu Shakti (preservation) and Shiva Shakti (liberation, and/or destruction). In Jainism, om is regarded to be a condensed form of reference to the Pancha-Parame? ?hi, by their initials A+A+A+U+M. "Om" is one syllable made from the initials of the five parameshthis. It has been said: "Arihant, Ashiri, Acharya, Upajjhaya, Muni“. Esoteric Buddhists place Om at the beginning of their Vidya-Sadaksari ("Om mani padme hum") as well in as most other mantras. More broadly, Om is said to be the primordial sound that was present at the creation of the universe. It is said to be the original sound that contains all other sounds, all words, all languages and all mantras. 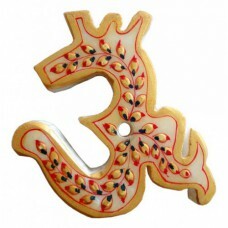 Placement: Aum is ideal for placement on the entrance wall or any eastern wall of your house /office /workplace….